Yo Ho Ho – it’s all hands on deck for this swashbuckling pirate birthday adventure! 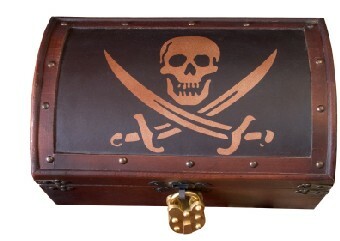 Wild Pirates must set off on a treasure hunt through Wildchild Wood to locate the missing pirate treasure. But take care not to get captured by the enemy on this awesome children’s pirate birthday party! Once the treasure has been found pirates must escape by setting sail on the Pirate Party Toboggans, leaving Wildchild Island and the evil Blackbeard behind. Watch out – you don’t want to be the first to walk the plank! Our Wild Pirate party combines imagination, story telling and adventure to create the perfect party for pirate-loving kids! Something you’re not sure about? – Read our Frequently Asked Questions. Price: £249.00: Up to 16 children. Extra guests £12.50 (can be confirmed and paid for 1 week before party date). Additional party guests for £12.50 each (instead of £15.00 each). What’s included: Venue hire, activities, and qualified instruction. Food is not included. However, we do provide indoor seating area, drinks and a Wildchild party host to assist and clear area. We recommend that you provide basic party food (e.g sandwich, crisps and biscuit) as we only allow 20-25 minutes for food. Drinks and cups are provided. “We were amazed at how the children took on the role of being pirates so seriously, hunting for the letters in Jack Sparrow fashion! They loved the toboggans and I think would have been quite happy to stay there all night! We will highly recommend Wildchild parties and thanks for giving us all a day to remember”. “Thank you so much for a wonderful party. All the boys had a wonderful time. Barney thought it was “so cool!” and Alfie’s favourite part was finding the pirate treasure in the woods”. “Everyone thoroughly enjoyed the afternoon and Ella is already hoping to come back next year! The instructors brought an enormous amount of fun to their interactions with the children and their encouragement meant that even the more timid guests enjoyed their search for Blackbeard’s treasure. It was the least stressful party we have hosted to date and we would highly recommend you”.